Over the past week, I have started to transition out of full time teaching so that my departure at the end of the upcoming week will be smoother for the students. It has been a little strange not teaching during the algebra classes, although I have still been busy taking care of other tasks around the classroom. Questions about the amount of time I have left in Chicago have been increasing in frequency from the students, and some students still seem to be clinging to the idea that I will return to Walsh at some point this school year. 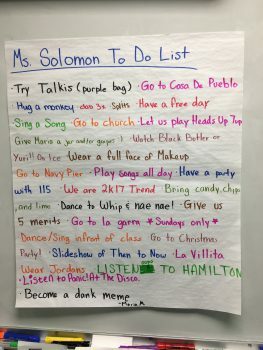 The students in my homeroom class – the 7th/8th split – decided to create a “To Do” list for me to complete before leaving Chicago for the semester. Some of their ideas, such as trying the Hot Chili Pepper & Lime flavor of Takis tortilla chips, are definitely doable; however, other ideas, like hugging a monkey, might be a little trickier to check off the list. Either way, I won’t run out of things to do during my last week in Chicago! In addition to working with students and attending volleyball games after school, I have been trying out different coffee shops in the city. Although La Casa is great, it can help to have a change of environment in order to be productive with the remaining tasks left to complete for student teaching. 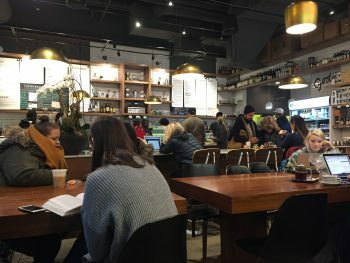 I have gone to the Jumping Bean in Pilsen, as well as the Goddess and the Baker, Intelligentsia Coffeebar, and Dollop Coffee Co. Coffee and sweets are always a good combination when in need of a little extra boost to get through the remaining grading, lesson planning, and reflections! The last art event of the semester was a play called Hard Times, performed at the Lookingglass Theatre. As a student teacher, my day starts quite early, making it difficult to stay out late enough for events such as this; however, I could not have missed the performance, even though it meant staying out until 10:30pm. I took theater classes throughout high school and love going to performances, and it seemed fitting to bookend my time in Chicago with performances that brought to life the theatrical talent and vivacity of the city. This weekend, I had the opportunity to attend the “One of a Kind” craft fair held at The Merchandise Mart downtown. The building, which is so large that it used to have its own zip code, set up the entire seventh floor for the fair. It took three hours to walk through all of the aisles, and it was amazing to see the variety of ideas the artists had brought to life. One artist turned books into clocks, and he creates specialized clocks with books whose themes can help tell the story of an individual’s life. Another artist made bowties from bird feathers, while another created elaborate sculptures from everyday kitchen and garden utensils. Regardless of whether the artwork was within my price range for Christmas shopping, the creative part of me loved seeing the variety of ways in which everyday items were repurposed or reimagined to create something beautiful. This art fair, like many other aspects of my experience in Chicago, has taught me that beauty can be found anywhere in the people, places, and history of this city.